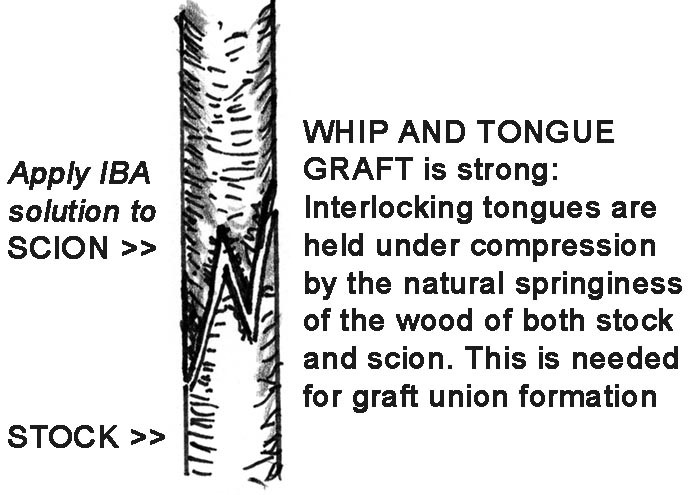 Success of a graft union depends on the establishment of a callus bridge between the cut surfaces of scion and stock, and the subsequent establishment of a functioning vascular cylinder connecting scion and stock. Initial callus formation appears to develop about equally on the cut surfaces of both partners, arising not from the cambial layers but from parenchyma cells, mostly in the wood just inside the camblum. Soon after scion and stock calluses have merged, callus cells just below the cambial cells of the scion begin to divide in the same plane as the camblum. Waves of cell division proceed from the top down, suggesting that a regulatory stimulus moves to the cut surface from the growing-shoot tip. Callus parenchyma cells inside the new camblum cylinder re-differentiate into functioning xylem cells. Last of all, the new cambium begins producing phloem cells. We sought to enhance that regulatory stimulus by applying a solution of a synthetic growth regulator. In the dormant season, we prepared whip-and tongue bench grafts of seven hardy varieties with potential as winter-tolerant frame builders. On half of the grafts of each variety, we applied a 2000 ppm solution of IBA (3-indole butyric acid) to the cut surface of the scion before joining stock and scion. After four weeks of callusing in a storage cellar at about 45 to 50F, we planted the grafts in the nursery; during the summer, we provided normal tillage but no irrigation. Trees were harvested in November. We evaluated each set for survival and for tree quality. With all seven varieties, survival was greater for the IBA-treated grafts than for those not treated; with five of the varieties, all treated grafts survived. We have not made microscopic examination of the progress of union establishment and vascularization after IBA treatment, but it seems probable that the IBA is increasing both the formation of callus and the rate at which the new cambium cylinder is differentiated through the callus parenchyma cells. 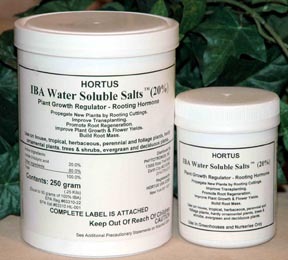 Using one of the common rooting compounds, such as the 2000 ppm IBA solution reported here, may improve both grafting success and tree quality of bench-grafted trees. Powdered proprietary mixtures could offer advantages over the liquid mixtures and should be tried. The technique is sufficiently promising to merit small-scale trial.